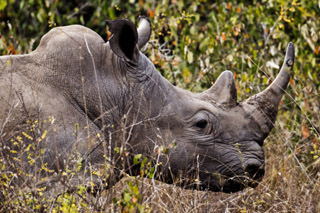 African rhinos are divided into two species—the black rhino and the white rhino—living in open savanna and threatened by the illegal trade of their horn. Southern white rhinos, once thought to be extinct, now thrive in protected sanctuaries and are classified as Near Threatened. But the Northern white rhino subspecies is believed to be extinct in the wild and only a few captive individuals remain in a sanctuary in Kenya.